China is building hundreds of new coal-fired power plants capable of generating a total of 259 gigawatts (GW) of electricity—that’s equal to the entire existing U.S. coal fleet of around 266 GW, findings by advocacy and research group CoalSwarm show. Most of the new developments owe to a rapid rise in coal plant permit approvals by China’s provincial authorities from late 2014 to early 2016, according to the report, released Sept. 20. As much as a three-fold increase in coal plant permits were observed in 2015 compared to 2013. “Guaranteed tariffs, easy access to cheap credit, and a recent permitting spree by provincial authorities have led to a rapid build-up of coal power capacity in China,” the report said. As of 2018, China’s coal capacity sits at 993 GW. The country is responsible for 48 percent of the world’s coal-fired power supply. The new developments, once completed, would increase the country’s coal capacity by 25 percent to 1252 GW. This would exceed China’s own coal power cap of 1100 GW as stated in the country’s 13th five-year economic plan for 2016-2020. The boom in the number of coal plants in the country reached overcapacity. By 2015, the average coal plant use rate was at 49 percent, according to CoalSwarm. Central authorities sought to address the situation by devolving power to permit new coal plant construction to provincial levels in Sept. 2014—however, this only resulted in an even faster rate of permits. In 2016 and 2017, China’s central authorities issued new regulations and suspension orders to curb new coal plant developments by cancelling or postponing them. But loopholes and loose enforcement have rendered such measures only “partially effective,” according to CoalSwarm. The group’s plant-by-plant research, completed in July, found that construction continues at many plants despite restrictions. Their research included checking satellite images supplied by PlanetLabs, which revealed around 46.7 GW worth of new or restarted coal construction. For example, photos of Huadian Nanxiong power station in Guangdong Province in February 2017 and March 2018 show that construction proceeded despite it having been issued a suspension order by central authorities in January 2017. In Ningxia Hui Autonomous Region, photos show Huaneng Daba-4 power station has also undergone substantial development despite the restrictions imposed in September 2017. According to the report, of the 259 GW of new coal-fired power generation, 126 GW is in active construction and 76 GW were in unrestricted pre-construction development. The remaining 57 GW are frozen in mid-construction, but are expected to be completed. CoalSwarm said that central authorities appear little-motivated to cancel plants that have already entered construction. “Recently, the central government has begun restricting which newly completed plants can connect to the grid each year, perhaps to avoid exceeding the 1100 GW capacity cap,” the report read. In May, the NEA allowed provinces Shaanxi, Hubei, Jiangxi, and Anhui to restart construction of coal plants, and also loosened restrictions on Hebei, Jiangsu, Shanghai, and Zhejiang. Coal consumption increased about 3.1 percent in the first half of 2018, compared to the same period in 2017, head of the department and planning at the country’s National Energy Administration (NEA) Li Fulong said at a press conference on July 30, state media reported. Figures from the country’s bureau of statistics showed a 9.4 percent increase in electricity use in the same period. 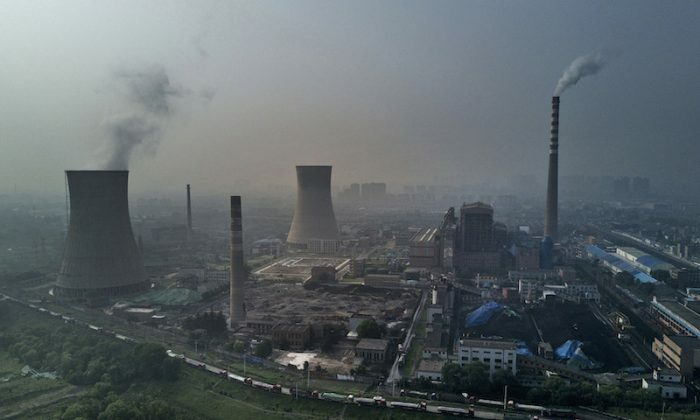 “According to the IEA, a 50% chance of limiting future temperature increases to 1.75°C requires that China phase out its traditional coal plants by 2045,” it said. Two air pollutants, PM2.5 and ground-level ozone, are responsible for the annual deaths of 1.1 million people and billions in economic damage in China.